Skip Matheny— currently a songwriter in the band Roman Candle and former bartender in a retirement community — caught up with the wonderful Pegi Young in Austin TX recently. Though she had been writing songs and poems since high school and married Neil Young along the way, she had never had the chance to properly record her first record until a few years ago. 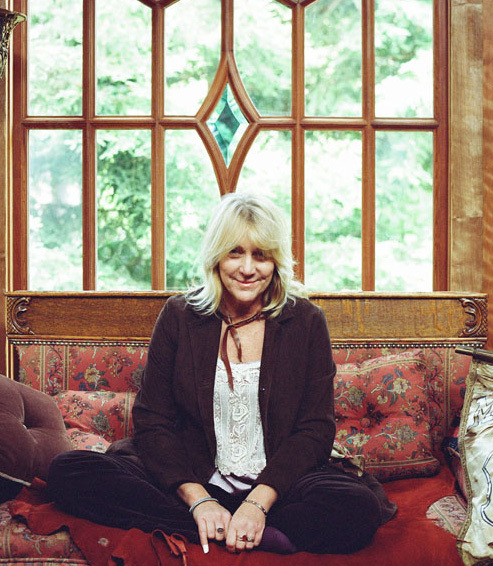 Many of the songs on 2007’s Pegi Young she wrote either in high school or while living in a teepee and tending bar in north California (incidentally, the same bar in which she met Neil). She has a very distinct voice as a lyricist, and its a rare thing to be able to hear a writer debut songs that she’s been living with for 20-30 years. The song key to love sounds just as appropriate coming out of a twenty-year-old’s mouth, as a woman whose been married for twenty years. Her latest record, Foul Deeds will be out June 22. I love water, love a lot of tea on show days, but red wine is also right up there. Good red wine. Some of the songs of your first record were written as far back as high school. When you were writing back then, were you typically writing lyrics or poems mainly? Was there music attached to it in your head? What were the origins of these songs like? Mostly poems, though on the first record “White Line In The Sun” that was a song that came out as a song, there’s a few of those. “Key To Love” was a poem that I came up with a little melody for. Oh thanks, man! I wrote it when I was twenty years old and never in my wildest dreams thought anybody would ever hear it. ‘Cause I was twenty years old living in a teepee, living this counter – culture lifestyle and didn’t even know any of these guys — Neil, or the wonderful musicians that I’ve gotten to play with, you know? I played around with my friends, just amateur, casual stuff. That’s amazing that a song written so far back would stand up so well on a debut album, years later in your life. I think I read also that [the song] “Heterosexual Masses” was written when you were working at a bar back at this time? Yeah that was right around that same time — I was [bartending] watching that ‘dance of the singles’ that was on. For Foul Deeds, were you starting from scratch with new songs, or did you or did you still have songs from over the years to record? Most of the stuff on the new record is way more current. I do still have some stuff — I’ve even got my book that I carry around with me — and I look at it, and look at it and I know one of these days a melody is gonna come in for it, ’cause I like it, you know? Absolutely. Any specific one from the new record come to mind as a “recent” composition? Yeah, “Foul Deeds,” the title song. I woke up and I was having this dream about Reverend Ike and this place the Palace Cathedral where we’d played up in New York. It’s up in Harlem and we had like six nights there, and that’s when we were still doing the theater show, so my band was opening for Neil and it just made an impression on me, that place. Something about Reverend Ike and the whole thinking about the singing going on in that church — and so I started to write something about that — and then all of a sudden this other song [“Foul Deeds”] came in pretty much just intact just the way it is. It’s just it’s really short; like we’ve timed it out, ’cause we were doing the set, its only like two and a half minutes, and it’s over before it begins. Typically do you more often start with lyrics and then sort of let the melodies arrive? Or does music come first? Most often it’s lyrics. I like lyrics and I think in words I guess somehow, sometimes they come in together which is always nice. It is convenient when that happens. It’s convenient. But “Foul Deeds” came in all nice and intact and there it was. There’s another song on the record from another time recently where I was driving down the road and I saw this big moving van and it was just like [makes buzzing sound]. So I pulled over and wrote down lyrics and then the melody. The basic melody came in pretty quickly after that. Then I was just tweaking on it and tweaking on it and I think actually Neil gave me a little passing thing that was just like this little link that put the two pieces together. I think it was just basically a chord change getting from an A back to an E minor. I was like oh yeah! Good idea! I love it when a chord change can pull everything in line. It really helped, it was like the song was in two sections almost or something. So yeah, its mostly lyrics for sure. Although now see I’ve been writing on piano a little bit more, and the piano tends to come in more with music and melodies. I did play piano when I was little, and I can figure things out differently on it than I can on the guitar neck. I still don’t even really understand the guitar neck; I have to count it out. What key am I in? I live I Nashville now so everybody there uses numbers for chords. It’s the most standard thing. Yeah, I haven’t caught up to that musical knowledge yet, so if we have to transpose something, we have to send the rest of the band outside to smoke or something. I think I read this somewhere about recording time, that you all arrange sessions around the full moon? Yeah, it kind of happened by accident the first time. Of course Neil is well known for working around the full moon and I think it is a really productive time. I don’t remember exactly now, ’cause its been a while, but it seems to me it wasn’t really planned — these were the available dates and then we realized [it was the full moon], and it was like oh, this is cool. And it was the three days leading up to it, the fourth day was the full moon and all that build was so productive, and everything was just going great. And then as it began to wane so did we! That’s really funny. The full moon is a really productive time — ask pregnant women the world over. Or emergency room workers. So literally we were in Reno, and it was the last show and I went to Elliot [Mazer, producer] and I said, “Can you see if you can book a session for me next week? See if all the guys can be available and get the team together and bring in Chad from Nashville?” ‘Cause if we didn’t get in the studio then we weren’t gonna get in until February. We have to be productive with or without the moon this time. There’s this really cool stated vulnerability in a song like “Fake” that I’ve never really heard on male songwriters’ records. You can hear it on a lot of Joni Mitchell’s records. Its just a very cool or rough-edged or experienced kind of vulnerability. Is this something that you’re conscious of? Are you consciously trying to portray particular characters or situations? Or are you just writing what comes out naturally? Oh, I am so flattered beyond belief to be even thought of in the same world as Joni Mitchell. I don’t think about trying to come out with a certain vulnerability or anything else. That song “Fake” was one when we were just flying somewhere and it just came through. You know it’s got something that sparks it, but then what I strive for is, the best songs have that universal quality, so people can take them into their own lives and interpret them for themselves, whatever their experience is. It’s a big, grand wish to be able to do that. Can you think of a time in the last few years when you were really just surprised by how good a piece of music was? Oh man, there’s some interesting people out there now. I was really surprised that Pink could get up in that thing and really sing at the Grammys! I was surprised at that. I was impressed. I was like what?! You’ve been witness to and participated in so many important recordings in the past few decades, both as a creator and an observer. You’ve worked with, or been in close quarters with, several of the more influential artists and musicians I can think of. From the position of trying to make good music or good art, is there anything you have learned or observed that seems to work across most all situations? Be true. Just stay true. That’s the best advice I’ve ever gotten from Neil, in particular, but many others around me as well. All the wonderful musicians I’ve gotten to work with. Anthony and I were just taking a walk here the other day, and I was nervous ’cause we hadn’t done a show and he said, “We’re going out there to groove, not prove.” But, for real, you know, don’t try to fake it — just follow your muse. Just follow where your artistry takes you. And don’t try to be “something” cause — I mean well look at American Idol; there’s some talented people in there, but there’s a lot of people who I think are just trying so hard to get something and they don’t even know what it is. That’s great advice — almost deceptively simple. It’s been a great time chatting with you Pegi and I really appreciate it. Thank you! I’ve really enjoyed chatting with you too.